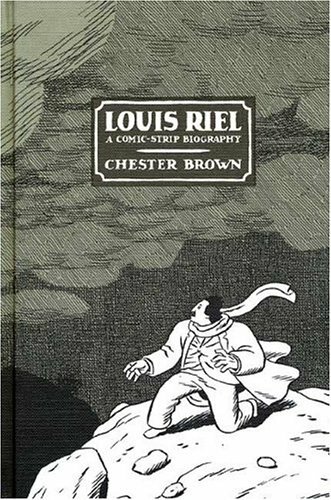 Okay, so I didn't know what to make of Louis Riel, A Comic Strip Biography by Chester Brown when I started it. It's a biography in graphic novel form of Canadian hero/rebel Louis Riel, depending on your point of view. It seems like complicated material for a graphic novel. Can you really break this topic down into tiny black and white boxes? I admit I don't know a lot about Louis Riel. I couldn't have been paying attention in history class. All I know is that people tend to get cranky whenever someone wants to put up a monument to Riel. He's a hero to some, a traitor to others. Riel was a Metis (a unique ethnic group with French and Native ancestry) in the Red River area of what is now Manitoba. When the Canadian government makes attempts to force the Red River Settlement to become part of Canada, the locals turn to Riel, an educated man with the ability to speak English to negotiate for them. That's when a tale of corruption, insanity, rebellion and racism begins. Brown admits that he took some liberties though he points out that he makes note of this in the Notes sections. For awhile, I thought he would make Riel a Super Hero who can do no wrong but things got a little weird when he has a vision and believed he was a Prophet. At least, he became a fallible hero after this point. I wouldn't write a term paper with this book as my only source but it is an interesting look at the man. Brown suggests other books for those who are interested in reading more. Even though it's a fairly long book, I read most of it in one afternoon and I get to count it as a book for the Canadian Reading Challenge. Yay! This book and the character is totally unfamiliar to me. I've come to love graphic memoirs and this one sounds good to me because I know next to nothing about Canadian history. It looks a bit not promising but tempting in some sense. I will read it right away. One of my all time favourite graphic novels. I'd read another biography of Riel before this one and it didn't compare in quality at all. I've never heard of Louis Riel before... I should learn more about Canadian history ;p My knowledge extends pretty much just to Champlain. . . I probably know as much about Louis Riel as you did going into this, and should probably brush up on my Canadian history. :) This might be a good book to start with, even with the liberties the author took with Riel's life.